Choice magazine has named two books published by the University Press of Kentucky (UPK) as Outstanding Academic Titles in its January issue. 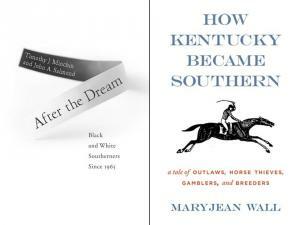 "After the Dream: Black and White Southerners since 1965" and "How Kentucky Became Southern: A Tale of Outlaws, Horse Thieves, Gamblers, and Breeders," written by UK alumna Maryjean Wall, made the list of titles the publication recommended to its readership. Choice's "Outstanding Academic Titles, 2011" reveals the best in scholarly titles reviewed by Choice magazine for the year. The honor brings with it extraordinary recognition from the academic library community as more than 35,000 academic librarians, faculty and decision makers use reviews in Choice magazine and from Choice Reviews Online to inform their collection development and scholarly research. Approximately 10 percent of the some 7,000 titles the publication reviews in a year make the list. The 2011 list, which can also be found published online at Choice Reviews Online, includes 629 titles in 54 disciplines and subsections. Choice editors base selections on the reviewer's evaluation, editor's knowledge of the field, and the reviewer's record. In awarding Outstanding Academic Titles, Choice applies several criteria to reviewed titles including: overall excellence in presentation and scholarship; importance relative to other literature in the field; distinction as a first treatment of a given subject in book or electronic form; originality or uniqueness of treatment; value to undergraduate students; and importance in building undergraduate library collections. "After the Dream," by Timothy J. Minchin and John A. Salmond, begins with King’s triumphant march from Selma to Montgomery. Minchin and Salmond focus on events in the South following the passage of the 1964 Civil Rights Act and the 1965 Voting Rights Act. "After the Dream" examines the social, economic and political implications of these laws in the decades following their passage, discussing the empowerment of black southerners, white resistance, accommodation and acceptance, and the nation’s political will. The book also provides a history of the often-overlooked period of race relations during the presidential administrations of Gerald Ford, Jimmy Carter, Ronald Reagan, George H. W. Bush and George W. Bush, ending with the election of President Barack Obama. In "How Kentucky Became Southern," former turf writer, UK alumna and part-time history instructor Maryjean Wall explores the post–Civil War world of thoroughbred racing before the Bluegrass region reigned as the unofficial "Horse Capital of the World." Wall uses her insider knowledge of horse racing as a foundation for an unprecedented examination of the efforts to establish a thoroughbred industry in late 19th century Kentucky. Key events include a challenge between Kentucky horse Asteroid and New York horse Kentucky; a mysterious and deadly horse disease that threatened to wipe out the foal crops for several years; and the disappearance of African American jockeys like Isaac Murphy. Wall demonstrates how the Bluegrass could have slipped into irrelevance and how these events define the history of the state. Offices for the administrative, editorial, production and marketing departments of UPK are found at UK, which provides financial support toward the operating expenses of the publishing operation. Choice is a publication of the Association of College & Research Libraries, a division of American Library Association.